An apicoectomy [or apico] is a surgery where the we expose the infection, clean out the area. 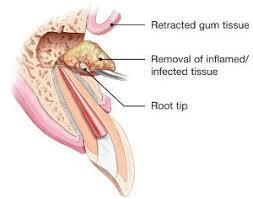 We then trim off the root end and place a root-end filling and then close and suture. It is predictable and in selected cases, the treatment of choice to resolve persistent apical infections. The video below shows the process rather clearly in condensed–the actual surgery takes about an hour. Contact us for more details.